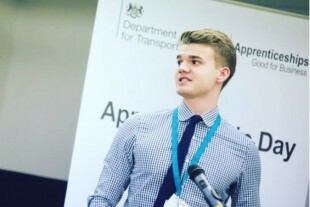 Hi I’m Stephen, I joined the Civil Service in September 2014 on the Civil Service Fast Track Apprenticeship Scheme; I started as a Capability Practitioner in HMRC’s Chief Technology Office. Whilst on the scheme I worked towards two recognised qualifications, a Level 4 HNC and NVQ in Business. The route I took into the Civil Service was not your typical one, as I left college entirely unsure of what it was I wanted to do or study. I opted for part-time work whilst I took the time to figure this out, eventually this turned into a full-time position. Then, at 20, I resigned from my full-time job to join the Fast Track Apprenticeship Scheme, mainly due to the exciting career prospects the Civil Service has to offer. At the start of my apprenticeship, I was worried that I would be treated like a temporary member of staff but I immediately felt like I was part of a team and making a real difference. Managing the demands of a full-time job and studying at the same time is tough but the rewards are more than worth the effort. As well as the recognised qualifications, I have been overwhelmed with support, guidance and opportunities to help me develop in confidence. In November 2016, I was promoted to a Business Analyst in HMRC’s Development, Test & Operations – Core Business Platform. I am now responsible for providing day-to-day analytics and leadership within multi-disciplinary teams to support the biggest digital operation in Government. In addition, I have been encouraged to seek further education and I am currently working towards the BCS International Diploma in Business Analysis. I feel that the Fast Track Apprenticeship Scheme has been invaluable and the skills and expertise I have gained along the way will be vital to my career as a Civil Servant. The whole experience has been a fantastic opportunity to kick start my career, broaden my knowledge and meet some amazing people along the way.